Sharing my second project using the November new release. Today I am showcasing Season’s Tweeting with Evelin T Designs and coordinating Cutaway. Absolutely adorable images on this set and I love the handwritten sentiments. Great to create scenes. That is what I did with on my card. I started with stamping the images and colouring them with copic markers. Then I die cut the images using the coordinating cutaways. For the background, I die cut two white rectangle panels using the largest of the rectangle die from Essentials: Katherine Cutaway. On one panel I sponged Salty Ocean and Peacock Feathers distress inks leaving the top of the panel white. I die cut the other panel to an inch. 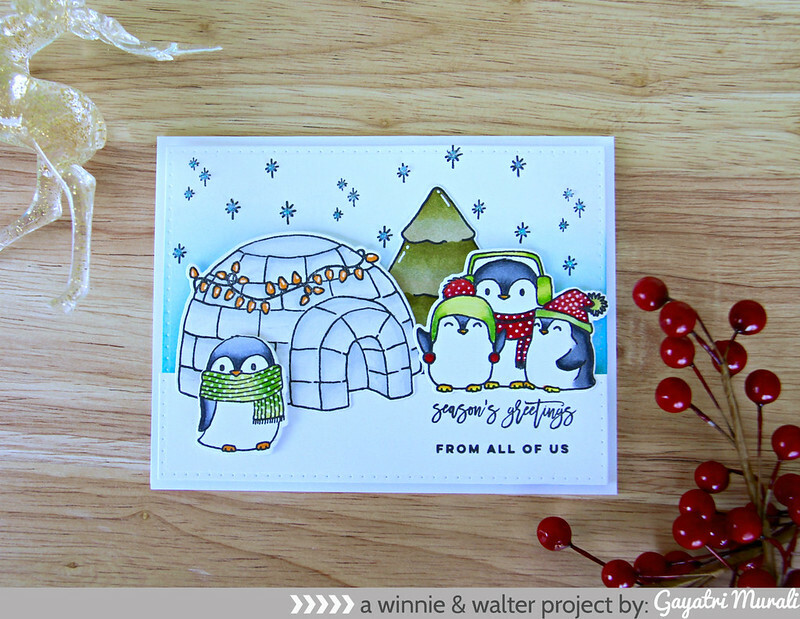 I stamped the green from Sentimental: Winter stamp set. Adhered this panel on top of the sponged side of the other panel using foam adhesives for dimension. I adhered the image die cuts as shown on the picture. I flush glued the tree and foam mounted the rest of the images grounding them to the sentiment panel. 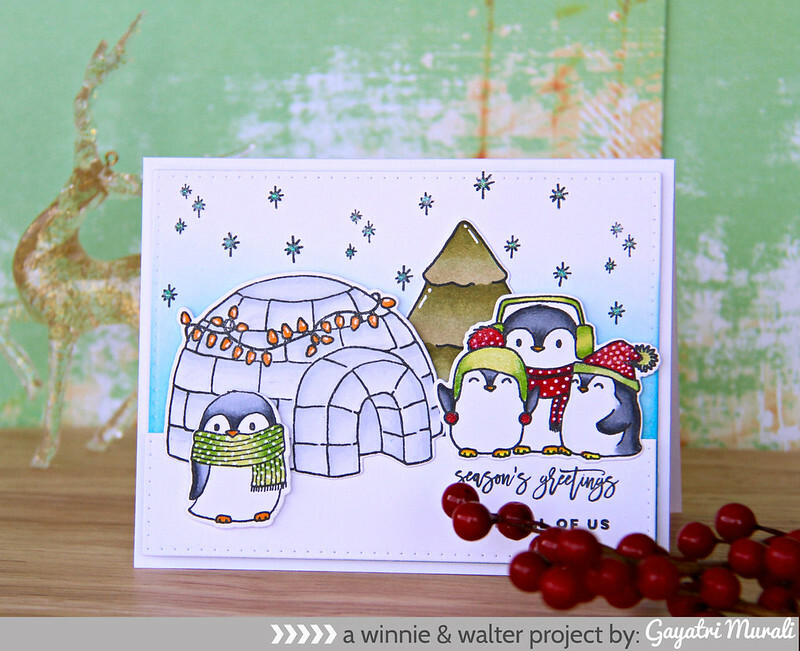 One of the penguin image is adhered on the front of the igloo using foam adhesives. I stamped the stars from the stamp set on sky and added White Blizzard Nuvo Crystal Drops to its centre. Then I used white gel pen to add details on the images. Cute huh! I love this set. Probably my favourite in the release. 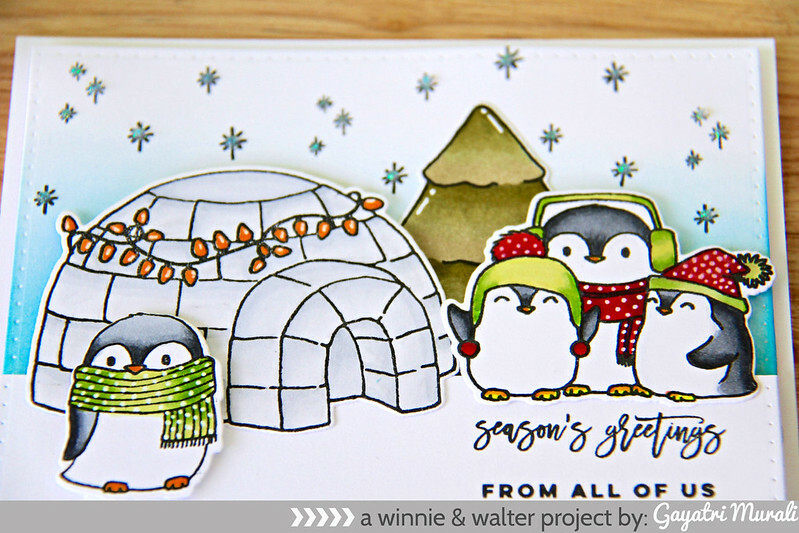 Both the stamp set and coordinating cutaway and the Sentimental: Winter stamp set are available for purchase from Winnie & Walter store. See you soon with more. Thanks for stopping by.